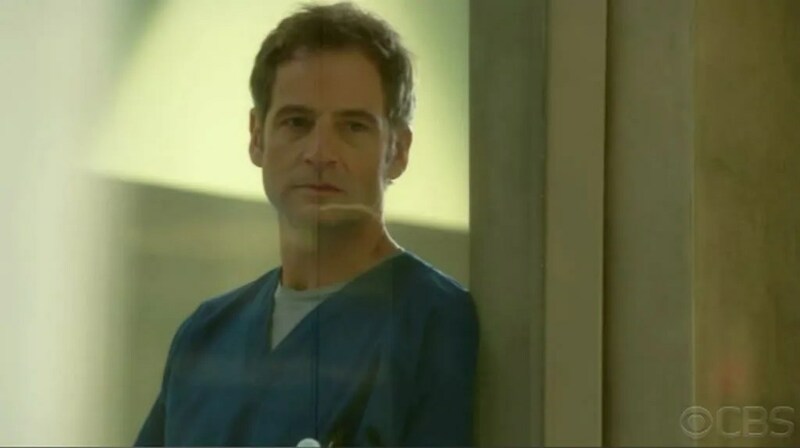 Miami Medical, you’re lucky you have Jeremy Northam! Dr Proctor and Dr Zambrano: who'd have thought it! Of course, as well as our poor unfortunates, we are getting to know our doctors. Last week, I was feeling a little underwhelmed by Lana Parrilla’s character (she seemed to be too in control, always the right word for the right situation, never flustered), but this week, we get to know her a little better and the end of the episode sees her VERY flustered, and by a mere cup of coffee! I must say I warmed to her, and she seems to have warmed up too. Her scenes with the control freak mother of the bride were very well played, and of course there was more flirting with Dr C. I’m hoping that next week, Dr C may work similar magic on me… and that the excellent Omar Gooding will be back. So, back to Fortunato and his pole. He is Doc Proc’s patient and, for me, this was the best strand of the episode. Please humour me for a moment whilst I say (because it HAS to be said…): “Jeremy Northam, what you DO to me!” Yes, I’m in love with HotDocProc already and I am loving the way Jeremy is playing him (and playing with us). This week, he was still “odd” but gone was the flippancy, the cocked eyebrow and the laughing eyes, and in was gravity, compassion and professionalism, and the occasional bit of fun: a little song in the operating theatre (I’m Looking Over a Four-leaf Clover) never hurt anyone, that was a lovely moment. The story of Fortunato and his pole is beautifully written and beautifully played throughout, but possibly my favourite scene is when Fortunato arrives at the hospital. Just watch Jeremy Northam’s face when he sees what’s in the back of the wedding caterer’s van… many another actor may just have looked shocked, but not Jeremy. We see shock, yes, we see fear, we see disbelief, realisation of what he has to deal with, we see compassion and sadness and we see that he is reminded of his Gulf War experiences, oh and probably lots more too. And all that in seconds. You watch again, you’ll see what I mean. Throughout the episode, Proctor is mentally revisiting his war experiences and his ‘deep, dark, awful secret’, but subtly, as ever with Jeremy; it’s nuance, he’s not wincing at loud noises and diving under tables, dribbling and raving. His references to “luck” give us a little more insight into why he is “slightly left of slightly left of centre” but we still have a lot more to find out than his explanation to a non-plussed Dr C gives us. I’ve said it before and yes, I’m sorry, but I am going to have to say it again, it is a real privilege to see this great actor at work. As for this week’s ending, nicely done! Dr Zambrano, in bed, “nekkid” (as promised by show runner Jeffrey Lieber) cup of coffee, Dr Proctor…we have almost a week to drive ourselves insane working that one out! What do you think??? Tune in next week for episode 4, All Fall Down. I’ll be back soon to whet your appetite for that one! Don’t forget, if you are in USA, you can watch episodes of Miami Medical plus lots of cool clips on the CBS website. Yes, also I am in love in Dr. Proctor. You have described it very well how Jeremy Northam plays. Because I everything do not understand ( language), I see this dramatic art with JN still much clearer, almost everything is to be read in his face and in his gestures. Really terrific review, I agree with all your points. I loved the part with DocP and Fortunato, we really got to see Jeremy’s training and skill in that scene, well done to the writers for using him so well there! Re: JN’s face/reaction when he sees what’s in back of the caterer’s van – you really nailed it. That scene struck me too – so beautifully performed. Subtle, yet powerful. This was a terrific episode and I was on the edge of my chair more than once. Thanks for the reminder about David Alpay – the guy looked familiar, but I couldn’t place him. I agree that the Fotunato plot was the best part of this episode. And yeah, you’re right, JN’s reaction to the catering truck was great. I went back and rewatched that scene two or three times. (I love the ability to rewatch shows online). I’m still not in love with this show. The writing seems kind of formulaic and weak, still. Seeing JN though on weekly basis, and shirtless at that, is making me stick with it. After all the suffering he did on the Tudors, it’s nice to see him playing something normal. I know it’s not exactly fluff, but the fact that I know he’s not going to be beheaded makes it almost seem like a comedy. Hi Jenny, thanks for your comments. I just checked out your blog, you have some great stuff there which I’m going to have to explore!